NSL has been a goldmine for scientists, providing an unparalleled opportunity to study the emergence of a new language. And in a new study led by Jennie Pyers from Wellesley College, it even tells us how language shapes our thought.By studying children who learned NSL at various stages of its development, Pyers has shown that the vocabulary they pick up affects the way they think. Specifically, those who learned NSL before it developed specific gestures for left and right perform more poorly on a spatial awareness test than children who grew up knowing how to sign those terms. “We know that the Picts had a spoken language to complement the writing of the symbols, as Bede (a monk and historian who died in 735) writes that there are four languages in Britain in this time: British, Pictish, Scottish and English,” lead author Rob Lee told Discovery News. Jonah Lehrer, mastermind behind Front Cortex, has “always been fascinated by tip-of-the-tongue moments. It’s estimated that, on average, people have a tip-of-the-tongue moment at least once a week. Perhaps it occurs when you run into an old acquaintance whose name you can’t remember, although you know that it begins with the letter “J.” Or perhaps you struggle to recall the title of a recent movie, even though you can describe the plot in perfect detail. What’s interesting about this mental hiccup is that, even though the mind can’t remember the information, it’s convinced that it knows it, which is why we devote so many mental resources to trying to recover the missing word. (This is a universal experience: The vast majority of languages, from Afrikaans to Hindi to Arabic, even rely on tongue metaphors to describe the tip-of-the-tongue moment.) But here’s the mystery: If we’ve forgotten a person’s name, then why are we so convinced that we remember it? What does it mean to know something without being able to access it? The larger question is how the mind decides what to think about. After all, if we really don’t know the name – it’s nowhere inside our head – then it’s a waste of time trying to find it. This is where metacognition, or thinking about thinking, comes in handy. At any given moment, we automatically monitor the flux of thoughts, emotions and errata flowing in the stream of consciousness. As a result, when a name goes missing we immediately analyze the likelihood of being able to remember it. Do we know the first letter of the name? Can we remember other facts about the person? Are we able to remember the first names of other acquaintances from high school? Based on the answer to these questions, we can then make an informed guess about whether or not it’s worth trying to retrieve the misplaced memory. Interestingly, a new experiment with a variety of primates (gorillas, chimpanzees, bonobos and orangutans) demonstrated that great apes also demonstrate some rudimentary metacognitive skills. The study, conducted by Josep Call at the Max Planck Institute for Evolutionary Anthropology, involved presenting the primates with two hollow tubes. One of the tubes came with a food reward, while the other was empty. The apes were then observed as they searched for the reward. Today, after nearly 20 years of studying animal communication, he can translate the forest’s sounds. This call means a Diana monkey has seen a leopard. That one means it has sighted another predator, the crowned eagle. “In our experience time and again, it’s a humbling experience to realize there is so much more information being passed in ways which hadn’t been noticed before,” said Dr. Zuberbühler, a psychologist at the University of St. Andrews in Scotland. Do apes and monkeys have a secret language that has not yet been decrypted? And if so, will it resolve the mystery of how the human faculty for language evolved? Biologists have approached the issue in two ways, by trying to teach human language to chimpanzees and other species, and by listening to animals in the wild. The first approach has been propelled by people’s intense desire — perhaps reinforced by childhood exposure to the loquacious animals in cartoons — to communicate with other species. Scientists have invested enormous effort in teaching chimpanzees language, whether in the form of speech or signs. A New York Times reporter who understands sign language, Boyce Rensberger, was able in 1974 to conduct what may be the first newspaper interview with another species when he conversed with Lucy, a signing chimp. She invited him up her tree, a proposal he declined, said Mr. Rensberger, who is now at M.I.T. Better insights have come from listening to the sounds made by animals in the wild. Vervet monkeys were found in 1980 to have specific alarm calls for their most serious predators. 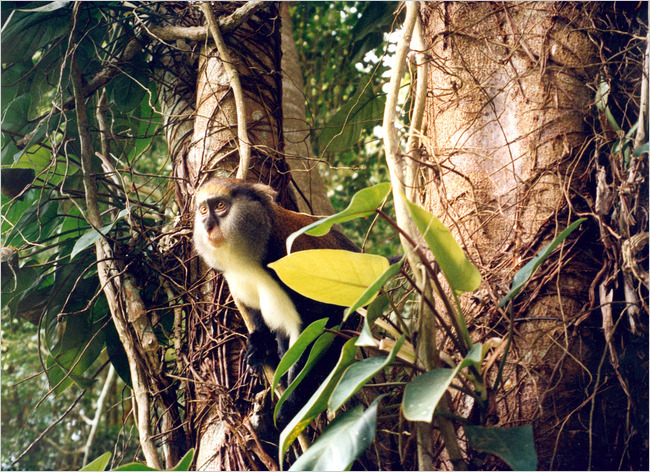 If the calls were recorded and played back to them, the monkeys would respond appropriately. They jumped into bushes on hearing the leopard call, scanned the ground at the snake call, and looked up when played the eagle call. Chimps, our nearest relative, don’t talk. We do. Now scientists have pinpointed a mutation in a gene that might help explain the difference. The mutation seems to have helped humans develop speech and language. It’s probably not the only gene involved, but researchers found the gene looks and acts differently in chimps and humans, according to a study published online Wednesday by the journal Nature. Lab tests showed that the human version regulated more than 100 other genes differently from the chimp version. This particular gene — called FOXP2 — mutated around the time humans developed the ability to talk. This tells you “what may be happening in the brain,” he said. I know this is OLD news at this point, but it is still so cool! This comprehensive (I think) compared vocalizations made by different apes, including us, and found them to be all pretty similar. In a new paper Gabrieli highlight the recent results of cognitive neuroscience research on dyslexia and its potential consequences for the treatment of dyslexic children through educative measures. What Gabrieli show is that dyslexia, an impairement in reading abilities linked to difficulties in phonological processing, can be detected very early on by brain imaging techniques and treated in some cases with specific training in reading during the beginning of learning. If left undetected and untreated, dyslexia can cause prolonged difficulties in reading abilities and decrease motivation to read. Dyslexia and its orthographic consequences could be of great interest for cognition-and-culture oriented scientists because orthographic errors generated by dyslexia or other processes produce linguistic variation at the origin of language evolution. Dyslexia, reaching around 10% of children, could therefore be an important factor of language evolution and may orient language evolution in different ways. If some words are more difficult to write and memorize for dyslexic children because the relation between their phonological form and their written form do not concord, dyslexic children may introduce new variants that are easier to learn for them. Read full post and abstract of paper. Not the dirty kind. Wow, I can’t believe it’s already September with no posting. And they’re only guaranteed to get more scarce once the school year begins. Animals can speak in different tones, according to one study. As in, they can say the same thing but in a pissed off way. Can they do sarcasm, I wonder? More and more linguists are finding holes in Noam Chomsky’s idea that language is wired in to all human brains. One is Lise Menn who studies baby’s language development, the other is a guy studying a group in the Amazon, the Piraha, who speak without recursion. Finally, anyone who’s interested in how humans express ideas should check out the book Proust was a Neuroscientist by Jonah Lehrer. The book looks at cognitive scientist through several authors who were exploring these concepts through literature and doing a very good job. I’ve only skimmed it so far, but definitely on my to read list. This article discusses a study that finds oldest siblings really are disciplined the most sternly. Being an older sister, in some ways that makes me feel better, but not entirely. This article is about a linguist at my university who has found close connections between indigenous languages here in the Pacific Northwest and indigenous languages in Asia. Language is awesome!